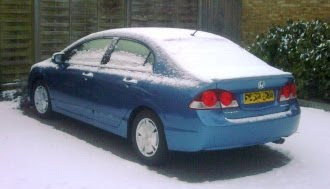 Since September 2009 we have been running a Honda Civic Hybrid. The hybrid mechanicals are, of course, housed in the frumpy four-door saloon body, ugly sibling to the pointy Civic hatch. So it’s not exactly a looker but it is comfortable enough, and besides it was chosen for its legs rather than its face. We think the Civic Hybrid makes great financial sense as low-CO2 transport, more so than many other alternatives – as long as you buy nearly new rather than straight off the boat from Suzuka. 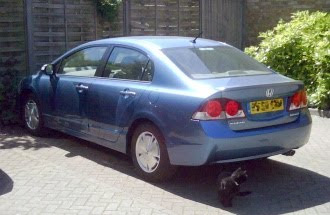 Buy second-hand and this green car’s catastrophic initial depreciation becomes your friend – the Civic hybrid loses cash in its first year like it has holes in its pockets, with almost 40% of its sticker price flying away as it racks up its first 12,000 miles. In year two, this precipitous depreciation has no option but to level off. From this point, the Civic hybrid actually boasts pretty good residuals. A one-year-old Civic is noticeably cheaper than a two-year-old Prius, for example, and as an added bonus the Honda will age much more gracefully over the following couple of years. A three-year-old Civic is worth £1,500 more than a four-year-old Prius. 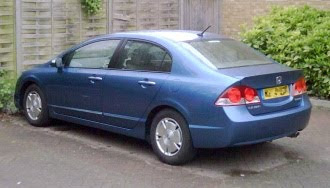 If you have about £12,000 to spend, for example, and plan to buy again in two to three years, a second-hand Civic hybrid will even manage to hold its value better than a Volkswagen Golf Bluemotion. So that’s one reason why we plumped for a year-old Civic hybrid in metallic blue, ES spec with leather interior. The other reason being that as a hybrid the Civic is Congestion Charge exempt in London, which means we can turn left out of GreenMotor towers as well as right without coughing up £8 a day to City Hall. We did, of course, have to hand over £10 to register our hybrid as an “alternative fuel vehicle”. It’s not actually an alternative fuel vehicle, of course, since it runs on ordinary unleaded petrol, but that’s OK with us. It seems the minds of our lawmakers are incapable of grasping how hybrids actually work, and the car is listed as being fuelled by petrol and electricity. Transport for London today confirmed that this anachronistic system is up for review, and it seems likely that from January next year a free pass will be restricted to green cars emitting 100g/km or less – which will rule out our 109g/km Civic. Fortunately there will be two years’ grace for hybrids already registered. The Transport for London form can be a bit confusing – on first reading it seems that a certificate from Honda will be required, stating that the car is a hybrid. In fact all you need to send is a photocopy of your V5 and a copy of the receipt you were given when you bought the car. TfL will then happily pocket your tenner and send you a letter confirming you’ll no longer be charged for rolling in and out of the C-Zone in your hybrid. We’ve tried it, and it worked. We’ll be posting again about our long-term hybrid test in the near future.